The endorsement of two important land bills by the National Assembly on 11 February has generated mixed reactions among commentators on land reform in Tanzania. Much to the delight of women Members of Parliament, the Land Bill and the Village Land Bill recognise equal access to land ownership and use by all citizens -men and women ­and give them equal representation on land committees. The new legislation also prevents the ownership of land by foreigners, and recognises customary land tenure as equal to granted tenure. Other issues covered by the bills include leases, mortgages, co-occupancy and partition, and the solving of land disputes. Several commentators took issue with the short time available for consultation and debate in Parliament of the nearly 900 pages of text contained in the bills. Now that they are endorsed, special pamphlets and periodicals are to be prepared and distributed in villages to ensure that people are conversant with the bills’ contents. Land offices in the regions will be provided with essential equipment and facilities to prove quality of administration, and functionaries will attend training courses to sharpen their skills on handling land issues more effectively. Customary ownership of land among peasants and small livestock keepers is now legally safeguarded and recognised as of equal status with the granted right of occupancy. Livestock keepers will now be able to own pasture land either individually or in groups. Rights to own land allocated by Village Assemblies, and land obtained under the Villagisation Programme during the 1970s, will also be recognised and protected. According to Mr Gideon Cheyo, Minister for Lands and Human Settlement Development, “This villagisation exercise should be taken to have been legally implemented and with good will. Problems that emanated here and there [during its implementation] will continue to be solved administratively” . Investors, including foreigners, will have no right to own land, in order to safeguard villagers’ interests. Instead, land will be issued to investors as tenants under special tenurial arrangements. Whereas the time limit on the customary ownership of land will be open, the granted right of occupancy will be for specific periods depending on the nature of business undertaken. This stipulation appears to have been made in response to strong objections by MP’s and non-governmental interests, to the provision ofa 99­year lease to investors as originally stated in the Land Bill. Such a long period would effectively have meant giving land to foreigners, their children and their grandchildren. Shorter periods were considered sufficient to encourage investments such as private tree planting operations. Dr John Shao noted in the Sunday Observer that there is a continued reluctance among policy-makers to accept the principle of private land ownership, a position which he dates back to Nyerere’s paper on “National Property” of 1958, despite the move towards privatisation in almost every other sector of the economy. While acknowledging the concerns that privatisation may lead to significantly more foreign ownership and control of the economy, he asks why Africans should continue to be excluded from owning their resource base. It is not yet clear the extent to which the new legislation will increase security of land tenure in practice. MP’s and NGO representatives cautioned that the legislation to encourage equal rights for women would fail unless attitudes of people changed accordingly. At a seminar in January, Ms Gemma Akilimali of the Tanzania Gender Networking Programme criticised customary law, the Marriage Act of 1971, and the Islamic law, accusing them of being the basis of discrimination against women, the youth and children. She argued that, for this reason, it would be a major flaw if the bills were to recognise customary land tenure. The approval of the two bills brings to an end a process which started in 1991 with the formation of the Presidential Commission of Inquiry on Land Matters led by Dar es Salaam Law Professor Issa Shivji. The Commission’s report was considered by many as an extremely well researched and argued document. It recommended an innovative model for a new tenure regime which, if implemented, would decentralise land administration and raise the status of customary smallholder tenure in the interests of the people. However academics have argued that the process of policy development has been hijacked by a small elite of senior civil servants who ignored or selectively appropriated the evidence and recommendations of the Shivji report and views of other non-governmental interests. In doing so, they managed to side-step political pressure for reform. In contrast, Mr Cheyo has claimed that the Shivji report was utilised in the preparation of the National Land Policy in 1995 as well as the two bills, and that the whole policy process was greatly enriched by the participation of various local groups. Similarly, Grantiana Rwakibarila argued in the Daily News that the reform process “tested and extended frontiers of positive activism”. In his opinion there was a fair degree of give and take between the government and non-government interests, and the process has brought state and civil society closer together. Yet the President remains the custodian of all land on behalf of the people, and for some commentators the fear of “dispossessing” the President lies at the heart of the problem with land policy: “Who is going to take that ownership away from the President and give it back to the people when leadership positions are so dependent on presidential good will?” asks the Sunday Observer. Under the Village Land Bill, the management and administration of land in villages will be placed in the hands of Village Councils under the approval of Village Assemblies. But the Bill also stipulates that the Minister for Lands and Human Settlement Development will be entitled to decide on the amount of land which could be owned by a single person or a firm, based on their ability, and the need for justice and sustainable development. Clearly the central issue of control over the allocation of land rights will continue to feature heavily in forthcoming debates once the new legislation is being applied and its effects begin to impact on the livelihoods of ordinary Tanzanians. In a strongly worded leading article in its March 25 issue the Daily News summed up the exasperation many Tanzanians are feeling about the extraordinary goings on in the major opposition party in the country -the National Convention for Construction and Reform (NCCR-Mageuzi). The article looked back to the high hopes and excitement in the country in 1992 when multi-partyism was first introduced. Many people had grown weary of years of one party rule by the Chama cha Mapinduzi (CCM) and the corruption which had penetrated it. The article referred to NCCR leader and former Deputy Prime Minister Augustine Mrema (without mentioning his name) who had ‘so mesmerised some people with his populist oratory … that he was virtually elevated to the status of a messiah …. (But) to their amazement and shock, the NCCR leader ‘has been conducting himself in a manner that is making many of his previous admirers thank God and sigh with relief that he was not the victor in the presidential elections of 1995 ….. The article went on: ‘the crisis now bedevilling the NCCR and the slow motion (and sometimes directionlessness) actions of other parties is undermining the very concept of multi-partyism. It is very sickening’ . All this referred to the long running split between Mrema (probably still supported by the majority of NCCR members, who recall his crusade against corruption when he was in government) and the other faction comprising most of the party’s MP’s and intellectuals under the leadership of Secretary General Mabere Marando. The High Court in Dar es Salaam gave its verdict on part of this long­running saga on January 27. It declared that Mabere Marando was the lawful Secretary General of the party. The meeting of the party’s National Executive Committee (NEC) in Dar es Salaam on June 20 and 21 1997 which had removed various leaders had been unconstitutional. Mr Prince Bagenda, who had been appointed by Mrema as the new Secretary General could be accepted as a lawful member of the party but he could not be Secretary General. The Judge stated that, in view of the chaotic situation in which the party found itself, ordering costs against either side in the dispute would be a burden on innocent party members. Surprisingly, the Mrema faction immediately celebrated the verdict and congratulated the winner; Marando embraced Mrema. People assumed that the party had finally resolved its differences. However, the opportunity was lost and the harmony was very short lived. According to the Dar es Salaam Guardian, Marando wanted the entire original Central Committee (CC) or Secretariat to be reinstated but Mrema was not willing to accept this as the earlier CC had supported him. On February 4 Marando went to court again protesting that the Mrema faction was forcibly preventing his group from entering the party’s offices. Marando claimed that he had to buy all the newspapers each day to find out what his chairman was up to. The Guardian described the two leaders as ‘politically immature, unprincipled and power hungry’. They had effectively denied members the chance to rebuild their party, it said. On February 25 Mrema asked the Court of Appeal to dismiss with costs a notice of appeal filed by Marando against part of the judgement. Mrema complained that the party’s Central Committee (CC), National Executive Committee (NEC) -which elects the CC -and National Conference had not met for 20 months. Marando, he said, had refused to call the meeting. Marando claimed that the CC was not recognised in the party’s constitution of 1995. Then, very rapidly, the situation deteriorated. Marando invited delegates to a National Executive Committee meeting in Dar es Salaam on March 18. Two days before the meeting, when Zanzibar delegates had already arrived in the capital, he moved the meeting to Zanzibar to the annoyance of Mrema. Mrema started making an opening speech but then walked out accusing Marando of planting 14 ‘bogus’ delegates and refusing to admit 36 ‘bonafide’ delegates. After his departure 56 of the 62 delegates then voted, according to the Daily News, to suspend Mrema from the party for ‘contravening the party’s constitution, indiscipline and not co-operating with party officials’. Two days later Mrema convened another different NEC meeting in Dar es Salaam attended by 57 NEC members and they then suspended Marando and other members of his faction. They appointed a new 19-member Central Committee (CC). According to the Guardian, Marando then said that, as only 12 legally recognised delegates had attended the NEC meeting, it had been ‘a mere tea party’ . On March 24.. a clearly exasperated Registrar of Political Parties, Judge George Liundi, refused to recognise the resolutions passed at both meetings and reinstated both Mrema and Marando to their original positions. He ordered the party to convene a general conference to elect national leaders or risk losing its registration. The General Conference was scheduled for May 2 in Pemba. G L M Mwamengele, a Guardian reader, wrote to the editor on March 25 begging him to stop publishing news about the NCCR as it ‘only served to embarrass every Tanzanian’. He also protested about government subsidies of Shs 31 million a month to the parties when so many Tanzanians were ‘languishing in poverty’. He and others wondered whether what was happening, and the apparent preference of the government party CCM for the Marando faction in the NCCR, might be part of a hidden agenda ­meaning presumably that the CCM was trying the ‘divide and rule’ policy. Just before this issue of TA went to press the Dar es Salaam Guardian reported that NCCR-Mageuzi Chairman Augustine Mrema had decided to set up a new party to be called ‘NCCR-Chama Cha Raia’ or ‘NCCR -Asilia’ and had selected a tentative list of some 19 national leaders. The list excludes all the Marando faction and the party’s MP’s. The next day Mrema denied the story. Better news for multi-partyism was the announcement by the Parliament’s Spea.~er, in January that, for the first time in the history of multi-partyism, he had chosen an opposition MP to head a parliamentary Standing Committee. Dr Walid Kabourou (CHADEMA) became chairman of the Local Government Accounts Committee. The next day the Speaker announced the appointment of opposition UDP leader John Cheyo as Chairman of the Parliament’s Public Accounts Committee. Clearly not understanding how multi-party parliaments work, eleven CCM members promptly resigned from the committees. After a week of deliberation on rules and court decisions in other Commonwealth countries, the Speaker announced that all the committee members had been re-appointed, to the delight of the opposition MP’s. They now have a chance to prove how useful they can be and John Cheyo MP, who is the opposition speaker on finance, has already begun pointing out scandals in government expenditure. A number of by-elections are pending. At Bunda, Musoma, the former NCCR MP Steven Wassira, who lost his seat on charges of electoral malpractice, resigned from the NCCR on March 19 saying that he could not stomach a ‘politics of squabbles’. He then went on to campaign for the UDP candidate Victor Kubini in the by-election. Nine by-elections resulting from the nullification of the earlier results have cost over Shs 1.4 billion. After the general election some 130 court cases were filed but 80 of these were voluntarily withdrawn by losers, 4 were dismissed when appellants failed to turn up and 41 were dismissed for lack of evidence. Further reflecting the exasperation of many Tanzanians about opposition politicians, a leading article in the East African on January 25 mentioned the Tanzania Peoples Party (TPP) of Dr. Aleck Che-Mponda ­which has no seats in parliament -amongst whose policies were said to be construction of a bridge between the mainland and Zanzibar, a helicopter ambulance service to take expectant mothers to hospital, the transformation of Tanzania from an aid recipient into an aid donor country and the destruction of all other opposition parties! Given, in addition, the disorder in the main NCCR-Mageuzi party the article concluded: ‘Public disappointment with the opposition has less to do with its antics than with its failure to come up with credible alternative policies. At this rate, come 2000, Tanzania’s opposition risks ‘infanticide’ at the hands of the CCM’. There are also now two factions in the Tanzania Democratic Alliance (TADEA), one led by the widow of the party’s founder Oscar Kambona and the other by Mr John Lifa Chipaka. The first signs of success in the battle against corruption are beginning to show. President Mkapa vowed at the last election that he would take firm action against it but during the first three years of his rule there was little visible sign of this. However, during recent weeks every arm of government seems to have been harnessed in the fight and all ministers and administrative officials are coming under heavy pressure from the President to produce results. Some say that he has his eyes on the general elections to be held next year and that he must clean up his act before then. But, if the political climate continues as it is now he has little to fear in the elections and his victory seems certain. He has two major weapons -the Tanzania Revenue Authority (TRA) and the Prevention of Corruption Bureau (PCB) and both are now flexing their muscles. The Revenue Authority has greatly improved revenue collection and stopped a lot of fraud. There are a number of recent examples. A wealthy Dar es Salaam businessman has had his private plane and yacht impounded and two bank accounts frozen by the TRA for alleged tax evasion amounting to $11 million according to the East African (March 15). He has filed suit asking the High Court to prohibit the TRA from conducting any independent assessment of his business. The TRA also claims that the number of businesses registered to collect the old ‘Sales Tax’ was only about 4,000 but almost 11,000 businesses had registered under the new VAT scheme which took its place on June 19, 1996. On March 28 it was reported that 38 traders who had evaded payment of VAT had been fined. A TRA team also recently ambushed ten people who were unloading bags of sugar, on which customs duty had not been paid, from a dhow at Kunduchi beach near Dar es Salaam. Several others who were involved were said to have plunged into the ocean and avoided arrest. On March 17 eight people were charged in court by the TRA with being found in possession of 269 bags of sugar on which duty had not been paid. According to the Daily Mail the TRA also seized recently eight containers full of TV’s and video recorders destined for the army. It was believed that tax had not been paid. The Daily News reported on March 5 that two senior officers of the Authority’s VAT Collection Department in Arusha had been suspended pending investigations into corruption. Two days later the TRA caught 12 Dar es Salaam shopkeepers who had evaded paying VAT -they were fined Shs 2 million each. The Prevention of Corruption Bureau (PCB) which has recently recruited and trained 80 additional officers, is also beginning to bare its teeth in the fight against corruption. A traffic police sergeant in Dar es Salaam was caught when a tractor owner paid him a Shs 30,000 bribe to get his tractor released (it had been impounded for not having an indicator). He was found in possession of 36 driving licenses. Regional Police Commander Alfred Gewe asked those drivers whose licenses had been confiscated by the police and whose cases had not been reported to the police to come and see him in person. The Bureau is holding a Dodoma Resident Magistrate for soliciting a Shs 50,000 bribe from a widow. Next day the Bureau caught red handed a Dar es Salaam businessman posing as a State House official who had accepted a Shs 6 million bribe to certify a maize consignment (in a warehouse on Nyerere Road) as being of good quality. He agreed not to close the warehouse. Two days later it was learned that the Dar es Salaam Health Commissioner and three of his subordinates were being questioned about the same case because they had been seen with the alleged suspect. On March 3 five traffic police officers were sacked after seizing a truck containing stolen bales of clothes and then accepting a bribe of three bales worth Shs 1.2 million to release it. On March 9 Health Minister Dr. Aaron Chidua announced that 85 of the Ministry’s employees including 19 doctors and 37 medical assistants were being investigated for possible corruption. On March 13, a doctor at the Mount Meru Hospital was arrested having accepted a bribe of Shs 4,000 which was paid in notes marked by the PCB. But the Minister pointed out that people were often afraid to report incidents under his ministry because of their fear of retaliation from medical practitioners. Some 9,700 debtors of the defunct Tanzania Housing Bank have been instructed to repay loans amounting to Shs 12 billion by June 30 or have their houses auctioned. The Tanzania Peoples Defence Forces (TPDF) are reported to have suspended two senior officers and several NCO’s following allegations that they demanded Shs 150,000 as bribes in a recruitment ‘scam’. Some 8,000 youths were said to have been swindled out of Shs 1.2 billion last year. Answering criticisms that the PCB concentrated only on ‘small fish’ its head said that the problem was that nobody was offering evidence on which to bring about the arrest of the ‘big fish’. She published the Bureau’s telephone and fax numbers. Minister fur Communications and Transport Ernest Nyanda announced on March 4 that five senior officials including the Managing Director of the Air Tanzania Corporation (ATC) had been suspended in connection with massive misappropriation of funds including the embezzlement of Shs 300 million. They were alleged to have been involved in the theft of Jet fuel and tampering with the flying hours on log books. -a Finance Minister and his deputy and a Minister of Natural Resources had lost their positions. But, according to the Daily News, the President said that he would not ‘succumb to the slippery path of being an inquisitor of his predecessor’s government’. The results of the direction to Regional and District Commissioners to conduct public hearings on corruption had been good and legal and administrative actions were being taken by the appropriate authorities. People are beginning to notice the change. Under a new Bill passed by Parliament which is designed to reduce unemployment, employers will be severely punished if they employ foreigners in a variety of jobs after May 1 1999. The government has published a list of 24 businesses whose operation will be reserved for Tanzanians. The list includes retail and sub-wholesale shops, small hotels with up to 20 rooms, restaurants, photography, chicken rearing, carpentry, bakeries, milling machines, laundry, radio repairing, guest houses and bureau de change. In another list of 13 other businesses including consultancy services, cargo handling, catering services, publishing, printing, shipping agencies, supermarkets, garages and cinemas, foreign operation will be allowed only if Tanzanians own 50% or more of the business ­Daily Mail and Daily News. Tanzania is among the top 20 countries in the world in GDP growth. The world economy is likely to grow by 1.3% on average this year but Tanzania is anticipating a growth rate of 5% -Sunday News. President Mkapa officially opened the Resolute Company’s Golden Pride gold mines at Lusu in Nzega on February 6. It is the country’s first large scale gold mine. The Bulyankhulu (Geita) and Kiabakari (Musoma) mines have been re-opened. As the gold boom in the Lake Victoria region gathers pace, Danish investors have already disbursed $610,000 for a new ship on the Lake; it is under construction -Daily News. The Bank of Tanzania suspended operations of the Greenland Bank in Dar es Salaam on April 1 following similar action taken at its Uganda HQ. The TAZARA railway has extended its service to Kitwe in Zambia to speed up the transportation of copper. The new service is expected to reduce transit time for cargo between Dar es Salaam and Kitwe from 10 to 4 days. China has recently provided 24 new coaches and six buffet cars for the line -New African. Precisionair has bought 3 new 19-passenger planes from the Czech Republic and has started new routes to Moshi, Mafia, Inringa and Mbeya -Daily News. Asian Kilombero M.P. Abbas Gulamali surprised participants attending a workshop on poverty in Dar es Salaam in December when he said that he was glad that Mwalimu Nyerere had nationalised Asian property in 1967. He thought that otherwise Asians would now be subjected to intimidation by the indigenous people who were becoming continually poorer than their Asian counterparts. He said that during the era of Nyerere businessmen like himself were nicknamed ‘Makupe’ but were now respectfully called ‘the informal sector’. According to an article in the South African ‘Business Day’ (February 15) government bureaucracy and an unpredictable investment climate have led to the loss of at least two $2 million ventures -in 1992 the South Korean Hyundai car company took its money to Botswana and a Middle Eastern farmer who wanted 10,000 h of land to grow mangoes was denied the land by local authorities. The Executive Director of the Tanzania Investment Centre Samuel Sitta was quoted as giving the example of an official of South African Breweries, the majority shareholder in Tanzania Breweries, who was held up for hours at Dar es Salaam airport because he didn’t have a yellow fever vaccination certificate. Minister of Tourism Mrs Zakhia Meghji has announced that the tourism sector was now contributing 16.5% of Tanzania’s GDP, was earning 50% of its foreign exchange and employing some 35,000 people. In 1998 there were 401,000 tourists compared with 295,000 in 1995. Three months before the three East African countries are due to sign a formal treaty under the ‘East African Co-operation’ which would harmonise tariffs, resistance against the plan is said to be mounting in Tanzania. Opposition is coming from businesses, intellectuals and some high ranking government officials -The Guardian. For the first time in 23 years Tanzania recorded a single-digit inflation rate (9.1%) in January. The Bank of Tanzania said that this was largely due to the government’s prudent monetary and fiscal policies. In December 1995 inflation was 29.7%. But commercial lending rates remain high at 20-25% while savings interest is only 3.5% -7.0% -East African. Mtwara, the second deepest port in Africa, is to be developed into Tanzania’s first modem free port from June this year following the signing of a memorandum between five South African companies and the governments of Malawi and Tanzania -East African. TANESCO suffered a reverse in its attempts to avoid paying the Malaysian­ financed Independent Power Tanzania Ltd. (IPTL) the $3.6 million a month it agreed to pay for electricity (under a 1995 agreement) when, on March 5 the High Court instructed it to pay until the tariff dispute is settled through international arbitration. T ANESCO has appealed. Prior to this IPTL was losing $3.6 million per month in capital charges on the $150 million project. Both sides have agreed to arbitration on the dispute -Guardian. The preliminary enquiry into allegations of treason against 18 senior members of the opposition Civic United Front (CUF) including four members of the Zanzibar House of Representatives, was finally concluded after the alleged plotters had been in jail for 14 months. The latest of four magistrates who have been handling the case, Mr Mshibe Bakari, announced on January 5 that the full trial would begin on January 15. The previous magistrate had given the prosecution a 60-day deadline in December to complete its investigations. There had then been a further delay until, on February 12, the magistrate gave the prosecution 14 days to submit its complete case file. On February 26 the charges were finally read in court. They alleged that the accused had made statements on November 27 1997 and on other dates which showed their intention to commit treason. The prosecution asked for more time to go through the evidence it had provided to the court and which, it said, it had not had time to study ­particularly the parts it considered too sensitive for public consumption which dealt with national security and should be tried in camera. The defence objected strongly and asked that they be given the evidence so that they could prepare their defence. However, according to the Guardian, the magistrate adjourned the case until March 3 and then abruptly left the court without answering the defence counsel’s demand. On March 3 the prosecution said that CUF had planned to recruit retired soldiers in a ‘Blue Guard’ revolutionary army. According to witness statements (quoted in the Guardian) from two former CUF members who had been expelled from the party for insubordination, a secret meeting had been held at Mbezi beach in Dar es Salaam to plan the alleged coup to overthrow the Zanzibar government. CUF announced on March 1 that it would continue its boycott of the Zanzibar House of Representatives until the CCM signed the I8-point peace plan drawn up by the Commonwealth Secretariat (See TA No 62) to end the political impasse. Zanzibar President Dr. Salmin Amour had earlier made it clear that the impasse could be solved only though the House of Representatives. A CUF representative, Mr Abbas Muhinzi, speaking at a one-day seminar organised by the East And Southern Africa Universities Research Project (ESAURP) and opened by Open University Vice­Chancellor Prof. Geoffrey Mrnari under the title ‘Zanzibar Political Plight’, said that, while Zanzibari’s could agree on the Commonwealth proposals, there were certain forces at work on the mainland hijacking efforts towards peace. Prof. Teddy Malyamkono of ESUARP described Zanzibar as the ‘black sheep’ in Tanzania’s political development. Prospects of a compromise solution suffered a setback when President Mkapa visited Pemba in March. According to the East African he made several defiant speeches that ran contrary to the Commonwealth proposals ­which had included one calling for an end to confrontational statements. President Mkapa insisted that CUF must accept that the 1995 presidential elections were won fairly by the CCM, something widely questioned by observers who were there. Western nations had no authority, he said, to tell Tanzania what kind of democracy it should have. There was nothing wrong with one party continuing to rule for many years, as had happened in Britain under Margaret Thatcher. The first item of business in the March session of the Zanzibar House of Representatives was to debate, again in the absence of CUF members, a speech by President Amour in which he had said, inter alia that ‘a thorn goes out where it goes in’. In other words, any political consensus would be reached inside the House of Representatives and not anywhere else. Several CCM MP’s attacked foreign envoys for ‘meddling in the internal affairs of the country’. One MP said that neither the Commonwealth Secretary General nor any foreign envoy could bring about consensus in the Isles. Several MP’s attacked the media for misleading people into believing that the House was meeting to discuss the Commonwealth-brokered consensus. There was no such thing, one said. A further element of confrontation between CCM and CUF had been reported in the ‘The African’ on February 5. It stated that Zanzibar Attorney General Ali Mohamed Ali was proposing that President Amour should be left to rule for life as he was liked by the majority of the population. President Amour’s second term of office ends next year and he is not eligible, according to the constitution, to stand again. The opposition said that the days of kingdoms and sultanates were over. Mwalimu Nyerere wrote in the Daily News that ‘If and when experience shows that the restriction laid down in the constitution needs to be changed (which in my opinion should be very very rare) the change should not lengthen the term of the current office-holder, who is bound in honour to observe the restriction under which he or she was elected in the first place. Otherwise it is difficult to see how future presidents can honour the new restriction’ . The Tanzania White Paper Committee on changes needed in the Union’s constitution has been debated in Zanzibar recently. The East African reported that virtually all Zanzibaris want to retain their separate identity and do not approve of proposals for a unitary government for the mainland and the Isles. One old man was quoted as saying that he was a Zanzibari first, a Tanzanian second and an African third. The opposition however favours a proposal under which there would be three governments -something opposed by the CCM. Karibu tena katika safari yetu ya kuvinjari maneno mapya ya Kiswahili. Kama mnajua, Tanzania mwanamume huoa na mwanamke huolewa, basi somo la leo linauliza: kwa nini kichwa cha habari katika gazeti moja la Dar es Salaam linatangaza kuwa ‘Vijana wa Kibongo waolewa Msumbiji’? Welcome again to the modem story. In Tanzania a man usually marries (kuoa) and a woman is married (kuolewa). So why did a recent headline announce ‘Dar boys are married in Mozambique ‘? Vijana wa Kibongo wanakwenda ‘Sauzi’ kubangaiza maisha huko. Wengi wanaishia Msumbuji baada ya ‘kuolewa’ na mishangingi ya nchi hiyo. Inaonekana kuna mayanki si haba waliokwama wakati wakienda Kwa Mzee Madiba. Wakipata ‘mama mlezi’ njiani hawana haja tena kwenda kubangaiza Sauzi. Kwa Mzee Chisano mama hawa huwatunza wajukuu wa Mzee Kifimbo, wanawapatia mavazi, malazi na kadhalika. Mbongo mmoja alidai: “Si unajua tena Wabongo tunavyopenda mporomoko”. This is amusing but it is also a harsh comment on social conditions in Tanzania. Strange as it sounds the traditional gender roles are being reversed and Swahili grammar follows suit. Thus the young men of Dar (Vijana wa Kibongo) are married to, rather than marry, sugar mummys (mishangingi) of Mozambique. This occurs on the way to South Africa (Sauzi) where they go to look for a better life (kubangaiza maisha). These guys (mayanki) don’t reach Mandela’s place (Kwa Mzee Madiba) because they find what they are looking for on the way. Once they have found a sugar mummy (‘mama mlezi’) they stay in Mozambique (Kwa Mzee Chisano). One other young man of Dar is not surprised that they stay in Mozambique since young men of Dar (Wabongo) like something that makes their life easier (mporomoko). Sauzi is the new slang for South Africa; it comes from South in English. Also known as Mr Madiba’s place -a nickname for Mandela. Mr Chisano’s place is a reference to Mozambique. Kubangaiza maisha is a colloquial way of saying ‘to get by’ literally ‘to push life’. Mayanki are the youth who ape American ways, the yanks. ‘Ma’ is a Swahili prefix for borrowed words. Mama Mlezi literally means stepmother ‘the mother of raising’ i.e. not birth. Here it has been juxtaposed to mean sugar mummy since these guys are well looked after. Bongo is another name for Dar, thus those who come from Dar are -Wabongo. Mporomoko is something that makes ones life easier, literally something that slides i.e. like the greasing of a palm. Mzee Kifimbo is the figurative Uncle Sam of Tanzania. Thus the grandchildren (wajukuu) refer to citizens of Tanzania. Pressure is increasing in DENMARK over whether the country should continue to provide aid to Tanzania as ‘the economy had not made any headway for the last 35 years’ according to a visiting Danish MP. The IMF has approved the third annual loan package of $82 million for 1998/99. Other recent aid includes: USA -$325,000 towards the cost of the national population and housing census. CHINA -$100,00 for famine relief and 45,000 army uniforms. The AFRICAN DEVELOPMENT BANK -Shs 8 billion for the establishment of a small enterprise loan facility. NOR WAY -Shs 1 billion for the Basic Education Programme and Shs 2.5 billion for construction of a 66 kilovolt power line from Zambia to provide electricity to Sumbawanga. UNDP -Shs 2 billion for economic management and private sector development. The EU announced on February 3 that it would not continue the programme it has been supporting since the 1980’s to finance repairs to Zanzibar Port because of concerns over the political deadlock and the poor human rights record on the Isles. Some $330,000 was involved. The WORLD BANK and EUROPEAN INVESTMENT BANK ­$45 million to overhaul the Tanzania -Zambia Oil Pipeline. The WORLD BANK has also loaned $105 million for the repair of roads and sewerage systems and the provision of water in eight municipalities. The NETHERLANDS -Shs 12 billion for rehabilitation of hospital diagnostic services. It is painfully clear that Tanzania will be unable to make significant economic progress until it is relieved of its crippling external debts, which currently swallow up a third of the annual budget for debt servicing alone. There is ample evidence of the crippling effect that this diversion of resources is having on health and education services and on economic infrastructure. In the last 13 years efforts have been made by the main industrial countries to provide relief from this damaging situation, supported and at times pioneered by the UK government, by offering facilities for rescheduling. The effect of rescheduling was to spread out repayments over a longer period of time, thus reducing the amount due in anyone year. It did nothing to reduce debt stocks and it soon became clear that the problems of some of the poorer countries would never be resolved until debt stocks were reduced to a level that could be reasonably sustained without serious detriment to education and health services and other government obligations. The result was the offer of debt reduction on what was known as the Naples terms (1994), the Lyons terms (1996) and now the Heavily Indebted Poor Countries (HIPC) Debt Initiative. The underlying purpose of the HIPC Initiative was to reduce the debt stocks of qualifying countries to a ‘sustainable lever and to provide for the reduction to be distributed among the participating creditors on an equitable basis. The Initiative has, however, come under criticism. The UK government considers the process to be too slow and has pressed for faster implementation. Norway takes a similar view and is working to achieve a reasonable degree of flexibility. In a recent article in the Financial Times, German Chancellor Gerhard Schroeder disclosed details of a new German policy aimed at intensifying (whatever that may mean) and accelerating the implementation of the HIPC Initiative. The German proposal introduces the idea of total cancellation of debts arising from development assistance in certain circumstances. Since armed conflict and political instability gravely imperil all attempts raise living standards in poor countries, the Chancellor plans to raise at the June meeting of the Group of Eight a proposal to associate debt reduction with a comprehensive strategy for conflict prevention. As the Chancellor’s article was marked a ‘personal view’ it must be read with some caution. Qualification for debt reduction requires the uninterrupted pursuit of a programme of adjustment and reform supported by IDA and the IMF over a period of six years. However the Boards of IDA and the IMF have agreed to a shortened second stage in the cases of six out of seven countries that have successfully completed the first three years of the qualifying period at the decision point. Tanzania reaches the ‘decision point’ towards the end of 1999 and it is theoretically possible that Tanzania might benefit from similar treatment by the Boards of the two institutions. Much will depend on Tanzania’s performance in the coming months. At ‘completion point’ a final assessment will be made of debt sustainability and debt relief beyond that level will be paid out. In the meantime Tanzania will continue to make crippling annual payments for debt servicing. The damaging effect of such payments has been recognised by the creditor countries and grants amounting to $660 million have been made by bilateral creditors, including the UK to cover three quarters of Tanzania’s expenditure on debt servicing this year. It is hoped that this degree of support will be forthcoming in subsequent years as Tanzania awaits a settlement at ‘completion point’. Doubt has been expressed in some quarters as to whether the ‘sustainable level’ of debt sought by the HIPC Initiative will be low enough to meet the needs of the poorest countries. Norway has announced its readiness to consider means to achieve a further reduction of debt in the case of poor countries completing the RIPC debt relief requirements. Tanzania is one of 22 countries receiving the benefit of special priority treatment by Norway. The FINANCIAL TIMES published a thoughtful and balanced 4-page supplement on March 31 in which it wrote that Tanzania was undergoing a transformation from being the standard bearer of African Socialism to an advocate of market driven reform. ‘The results are remarkable’ it wrote, and went on: ‘The mining sector is booming, tourism is growing, sold-off state companies are thriving and the government’s economic discipline has won the praise of the IMF ….. But erratic weather conditions saw floods last year and threaten a serious food shortage this year. Management is weak, the civil service is inefficient, phone lines are bad, roads are poor, illiteracy is increasing, health care is declining. Corruption is widespread and implementation of privatisation is behind schedule. Above all, Tanzania still has to overcome the legacy of the failed polices of the early post­independence period … Yet, for all these concerns, there is still a sense of opportunities being grasped and potential slowly being realised. On Zanzibar the article is much less optimistic. Extract: ….. (it is) mid­morning … and a few milling tourists peer from a safe distance at the armed police surrounding Zanzibar town’s court. The guns and nervous aggression do not tally well with the tranquil retreat they were sold in the tourist brochures. Yet the police, watchful lest 18 political prisoners …. escape from the latest in an endless series of treason hearings, are every bit as Zanzibari as the islands’ stunning beaches and fading clove fields …. Thank you Pru Watts-Russell and Marlene Yeo for sending this -Editor. 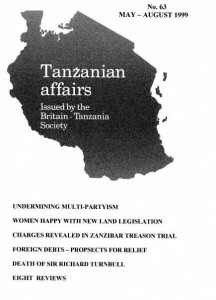 Under the heading ‘Tanzania Corruption Company Ltd’ Asha Mtwangi, writing in the BBC’s FOCUS ON AFRICA (April-June) described ‘Bongoism’ in detail. ‘Bongo’, she wrote, ‘is derived from the Swahili word meaning brain. If you’ve got one, explore it, use it and you’ll survive. Dar es Salaam is the heart of this new Bongoism ….. as you wonder how to beat the snaking lines of patients queuing for the only X-ray machine at the public hospital you have to ‘think fast’ …. Once the magic words have been said you will willingly part with a little something …. everywhere you meet middlemen, people with lists of contacts which would turn the yellow pages green with envy. You need a new passport fast. Someone knows someone who knows someone who can do it …. with wages of $42 a month in government service and $24 in parastatals it’s small wonder people survive by their wits. They have no option …. ‘ . 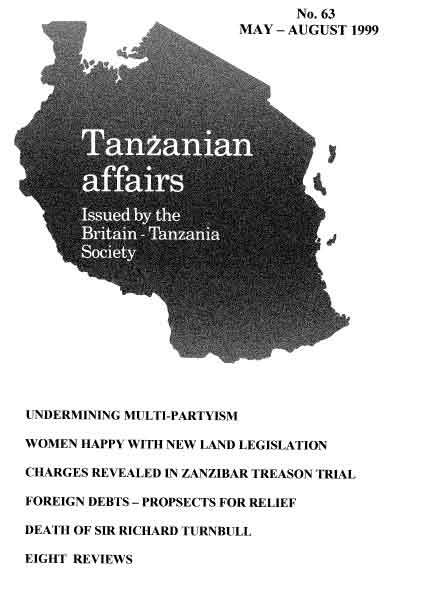 Peter Preston in the London GUARDIAN (March 15) described (with many references to the Warioba Report) what he termed Tanzania’s ‘institutional corruption’ and the ‘burning anger’ this was causing amongst the people. President Mkapa’s efforts to implement Warioba had waned in the face of intransigence from the very leaders the Commission had wanted sacked: too powerful; too entrenched. Would it help, he asked, if the British Government were to tighten up its act and stop the Inland Revenue from giving tax deductions for bribes paid by companies doing business in Tanzania and were to bring British law fully behind the new International Convention on Combating Bribery? It would help a little, he wrote. It would give the system one more squeeze Thank you John Pearce for sending this item -Editor. Reporting on Canadian Governor General Romeo Le Blanc’s visit to Cote d’Ivoire, Mali, Morocco and Tanzania, NEW AFRICAN (April) described Tanzania as ‘by far Canada’s most loved African country’. As part of the visit Canada announced $13.4 million of new aid. The Governor General was accompanied by some 100 parliamentarians, businessmen and government officials. Michael Carr and W Stephens in the TROPICAL AGRICULTURAL ASSOCIATION NEWSLETTER of March 1999 explained how the new industry-funded privatised Tea Research Institute of Tanzania (TRIT) might be leading the way for other commodity crops in Tanzania where similar changes in structure and funding of agricultural research were overdue. They explained the delicacy of the change from government sponsored research to privately conducted research and how it had proved necessary to close one research station in order to concentrate efforts at the two other stations -Ngwazi in the south and Marikitanda in the north. TRIT has set an ambitious target to raise annual production from the present 20-25,000 tons of made tea to over 40,000 tons in ten years. Reporting on a workshop on the International Property Rights issue in Zanzibar, THE AFRICA LINK (September 1998) quoted the ‘Father of Tanzanian cinema’, Mzee Rashidi Kawawa, as lamenting: “Our artists continue being ripped off by pirates….There is art all over the country -in the caves, in the ground, in ruins, in houses, on the pavements, everywhere . . . . . But our cultural rivals … have been stealing and plundering our heritage, taking them to their museums … pirates and copyright violators are killing artistic creativity … our artists languish in absolute poverty”. The Chairman of the local association of musicians (CHAMUDATA) John Kitime said that a group calling themselves ‘The Big Five’ now controlled all the audio cassette business in Tanzania. The South African Film Security Office is helping in the planning steps to combat the piracy. ‘Seven years ago Murtaza Fazal arrived in Tanzania with a kilogram of seaweed sneaked out of the Philippines. Only six grammes survived the journey’. So began an article in the FINANCIAL TIMES (March 24) which went on to explain how seaweed had overtaken cloves and was now second only to tourism in Zanzibar’s economy. Seaweed contains a gum called carrageenan that is used as a stabiliser and in ice cream, salad dressing, luncheon meat and shampoo. The dried product is processed in Denmark or the USA. Mr Fazal’s company has seen production increase from 150 tonnes from 150 tonnes in 1985 to 1,800 tonnes last year; Zanzibar as a whole produced 5,500 tonnes last year making it the third largest producer. nut Mr Fazal warned that high taxes, poor infrastructure and bureaucratic red tape risked destroying this highly competitive industry. “To export a shipment we have to fill in 21 forms for each of our 120 containers, and I have to sort things out at the port. In America I exported 4,000 containers and never saw the port” he was quoted as saying. The FINANCIAL TIMES (February 3) headlined its coverage of a recent international mining conference with the words: ‘Tanzania tipped as the rising star of Africa’. In the TIMES (March 1) the headline read ‘Prospectors beat a path to Africa’s (in this case, Tanzania’s -Editor) new streets of gold.’ And the SOUTH CHINA MORNING POST (February 28) under the heading ‘Foreign firms rush to tap potential of right rocks, right government’ highlighted what it described as the dramatic revival of the mining industry in Tanzania. It quoted Ashanti Exploration Managing Director Mike Cowley describing Tanzania as the number one country in Africa in terms of gold exploration. “If anybody wants to explore in Africa they will be trying to get a position in Tanzania” he said. The country had one of the best physical policies for mining in Africa. Thank you Ron Fennell for sending this latter item from Hong Kong. Details of the mining boom in Tanzania were given in Tanzanian Affairs No. 62 -Editor. Ikaweba Bunting of the NEW INTERNATIONALIST (January-February), reporting on a recent interview with Julius Nyerere recalled that Mwalimu had been the subject of the cover story in the very first issue of the magazine in 1970. ‘Three decades on’ he wrote ‘Mandela aside, Nyerere is still Africa’s most respected elder statesperson’. Extracts from the interview: On the Arusha Declaration: “I still travel around with it. I read it over and over to see what I would change. Maybe I would improve on the Kiswahili … but the Declaration is still valid. I would not change a thing”. On his mistakes: “I would not have nationalised the sisal plantations. Agriculture is difficult to socialise …. the land issue and family holdings were very sensitive. I saw this intellectually but it was hard to translate into policy implementation … ” On the World Bank: “I was in Washington last year. The first question they asked was ‘how did you fail’. I said that we took over a country with 85% illiterates … there were 2 engineers and 12 doctors after 43 years of British rule ….. When I stepped down there was 91% literacy and we had trained thousands of engineers and doctors …. As Tanzania’s social services have deteriorated during the last ten years when Tanzania has been signing on the dotted line and doing everything the World Bank and the IMF wants I asked them again ‘What went wrong?’ These people just sat there looking at me. Then they asked what could they do? I told them to have some humility. Humility -they are so arrogant! …….the conditions and policies of the World Bank: and the IMF are to enable countries to pay debt not to develop. That is all! ” Thank you Peter Yea for sending this -Editor. AFRICA TODAY (January) pointed out the importance of hunting to raise revenue to help with the grave problem facing preservation of wildlife. The article said that if wildlife was to have a secure future it was essential that a value should be attached to it. In 1997 some 950 hunters practised their sport in Tanzania and revenue in excess of $440 million was obtained. This worked out at Shs 42,000 per visitor compared with the Shs 700 per visitor in the case of photographic safaris. In the same issue there was an article on the success of radio drama in developing public awareness of AIDS in Tanzania -‘Mashaka is the best known truck driver in Tanzania and his exploits are famous throughout the country. He spends most of his time on the road, rarely sees his wife and has a girlfriend in every town. A few weeks ago he fell ill and Tanzanians are holding their breath, as he grows sicker by the week. He coughs, has rashes on the skin and complains that his friends are avoiding him …. Mashaka is a fictional character in one of the country’s most popular soap operas, Geuza Mwendo, and his plight is the talk of some six million people who listen to the show every week …. ‘. ‘Tanzanians who want to settle scores with old enemies only have to shout Mwizi! Mwizi! Immediately all hell breaks loose and in a matter of minutes their victim is dead’. So began an article in NEW AFRICAN (January) under the heading ‘Necklacing spreads to Tanzania’ (from South Africa) in which it was explained that mobs collect kerosene, matches and old tyres and then set victims ablaze. They call it Mwenge wa Uhuru the flame of freedom, after the uhuru torch which is raced annually through Tanzania …. ‘Many Tanzanians believe that the police are so inefficient that they are justified in taking the law into their own hands ……ignoring President Mkapa’s advice to them to stop killing the little thieves … “You have to deal with the huge looters who are milking this country dry” he said. ‘A man wearing only shorts and sandals walks along a track. He carries a hunting rifle for protection against wild animals. The sinking sun burnishes his back a deep bronze and sets aflame his shoulder-length hair. At his side lopes a lion cub, golden in the evening light. Tony Fitzjohn is among the last of a disappearing breed of game warden on a continent where wildlife is in retreat. Once an assistant to George Adamson, the renowned conservationist, the 54-year old Briton manages Mkomazi Game Reserve. The story of his amazing years in the bush is the subject of a forthcoming film To Walk With Lions starring Richard Harris as the magus-like conservationist and John Michie as his untamed protege ……..Fitzjohn has earned himself many enemies; not just sports hunters and commercial poachers, but also local Maasai people claiming ancestral grazing rights at Mkomazi……and powerful figures in the Tanzanian government who could make fortunes if sports hunting were allowed in the reserve’ -extracts from an article by David Orr in the TIMES on January 2. Thank you Liz Fennel! for this item ­Editor. Reporting from Toronto, Chris Roberts in AFRICA TODAY (April) wrote about the palpable excitement hanging in the air at the offices of the small Canadian oil-exploration company Canop following receipt of the results of exploration in Tanzania. Canop’s onshore and offshore concession, beginning 60 kms south of Dar es Salaam, if preliminary results are confirmed, would be able to plug into the planned natural gas pipeline of the SONGAS project led by two other Canadian companIes -TransCanada Pipelines and Ocelot Energy. The SYDNEY MORNING HERALD (February 20), discussing the debt issue, quoted the case of Angelus Mtego who is in his final year in school in Ludewa, southern Tanzania. He is 15 but no bigger than the average British 10-year old. His main ambition in life is to go on to secondary school but last year only 10 out of 70 in his year group were accepted. However, for Angelus the biggest hurdle is the cost. His father is too poor to pay his secondary school fees of US$IOO. The government had to introduce fees because of its huge budget deficit itself partially caused by Tanzania’s vast foreign debt. Thank you John Pearce for sending this from Australia ­Editor. Dr R Towey and Dr E Kimaro wrote in the BRITISH MEDICAL JOURNAL (December 19-26) about how difficult it was for local doctors to carry out research in sub-Saharan Africa. They wanted to find out the obstacles to safe anaesthesia in outlying districts near Lake Victoria and wanted hard data, not just anecdotes. They spent four months visiting 27 hospitals -sometimes hitchhiking, sometimes buying petrol for hospital cars to get lifts, sometimes sleeping in wards or in bus stations. Eventually they established a computer database with reliable data. Three-quarters of the hospitals had no oxygen or equipment to give safe paediatric anaesthesia. A quarter had no equipment for anaesthesia even for adults. ‘How do they manage? They give bolus doses of parental ketamine; the surgeon does his best without muscle relaxation and the patients’ lungs are not protected by a cuffed endotracheal tube; safe ventilation of the lungs is impossible; and, there is no oxygen … .it is a nightmare ….. yet the cost of upgrading the majority of hospitals to a safe level is $50,000 -the approximate cost of one anaesthetic machine in Western Europe’. The East African Wildlife Society’s journal SW ARA (October -December) joined the increasing clamour from conservationists around the world against the proposed prawn farming scheme in the Rufiji Delta which the government is supporting because it insists that it is environmentally viable. The article said that the 10,000 hectare project would privatise one fifth of the Rufiji Delta which contains eight of the nine species of mangrove found along the East African coast. Two thousand Delta residents were said to be seeking permission at the High Court to sue the government for endorsing the project which they say would deny them access to natural resources including prawns and fish which they have always had. The article concluded by saying that experience elsewhere had shown that such prawn farming failed on average after ten years, leaving behind severe environmental damage. Thank you Tony Macdonald for sending this information Editor. An article by Darrel Bristow-Bovey in the South African SUNDAY INDEPENDENT (February 14) reflected on the history of what we now call safaris since they began in 1895 with the establishment of the East African Protectorate (Kenya), a British response to German expansion in Tanganyika. The hunter’s trophies -horns, tusks -were tangible evidence of a land bent to the will of the settlers. The cost of safaris had escalated over the years. One safari in the late 1930’s entailed an armoured car, a mobile movie theatre, motorcycle messengers, a generator and a mobile drawing room with a grand piano. The writer went on: ‘r recently crossed the border to Arusha, safari capital of old Tanganyika. Once a rival to early Nairobi, it is now in a state of charming disrepair, home to the worst roads and best Indian restaurants on the continent….. The safari may have lost its false Hollywood glamour, but its fundamental purpose remains. It exists to mediate the experience of visitors to Africa -to keep them safe and well-fed yet to give them an inkling, however illusory, of authenticity. Safari takes you to the land, and in it you glimpse a better version of yourself, a dream of your place in the world … ..Thank you David Leishman for sending this and other items from the South African media -Editor. Michael Okema writing in the EAST AFRICAN (February 15) explained why there are so many albinos -at least two pupils in every school -in the Kijitonyama-Uzuri-Mwanyamala triangle of Dar es Salaam. He quoted researchers at the Ocean Road Hospital as saying that it was because of the matrilineal cultural practises of the coastal Wazigua, Wanguu, Wazaramo and Makonde ethnic groups. Similar genes in parents, usually found among relatives, were said to increase the chances of producing an albino child. As children of a maternal uncle belong to the clan of the wife of that uncle and therefore to a different clan from the children of his sisters and brothers, first cousins may marry, thus enhancing the chances of albino children … There is also the Arab tradition of marriage among relatives so that the family property remains within the clan. The Tanzania Albino Society says that the country has 700,000 albinos. Of the 200,000 in Dar es Salaam 60% are in Kinondoni, 30% in Temeke and 10% in Ilala. The way people often treat albinos, Okema describes as ‘apartheid in reverse’. The Oxford United Football Club was thrown a lifeline after the resignation of its managing director following allegations of fraud according to the WANTAGE HERALD (February 2). Mr Firoz Khan, who came to Britain from Tanzania at the age of 19 and who now owns 1,000 hotel rooms in London, apparently agreed to buy the club and to provide £500,000 to maintain it until the transaction was completed –Thank you Geoffrey Stokell for this item -Editor.